A slim volume from our collections provides a glimpse of the holiday festivities at a public American hospital more than 100 years ago. 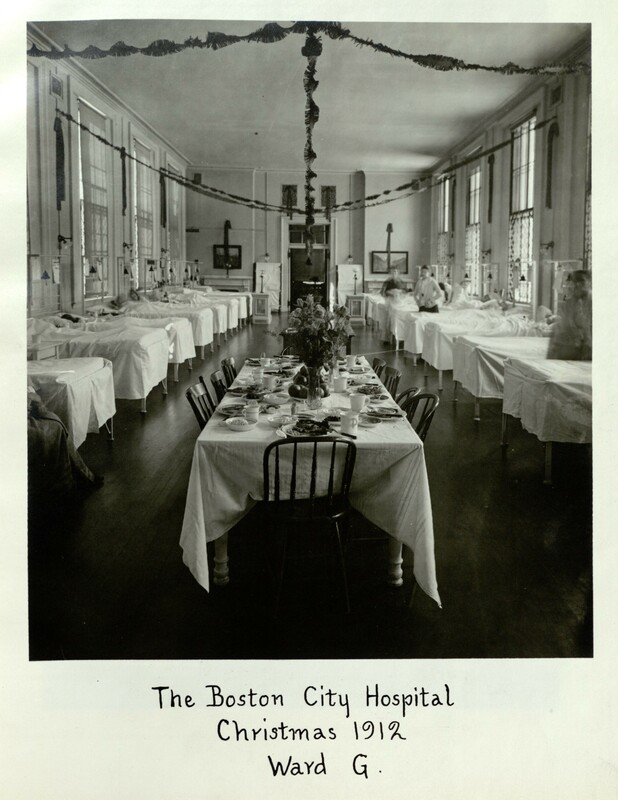 In Boston City Hospital, Christmas 1912 we find eight photographs documenting the hospital’s holiday adornments and celebrations. The stark black and white photos of vaulted ceilings and nearly empty rooms don’t paint the cheeriest picture of the holidays, but clearly the staff put a great deal of effort into the celebrations. These are pictures of the spaces more than the people in them. We see patients in their beds and the kitchen staff waiting for their holiday meal, but the people seem almost incidental. 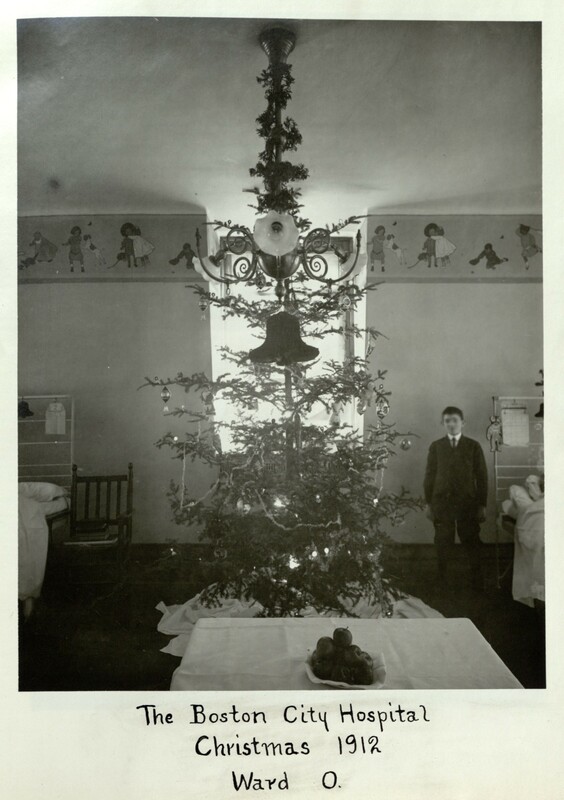 Some of the shots focus on the feasts on the table and the Christmas tree, while others capture the entire ward with garlands hanging from the ceiling and wreaths on the walls. These images are striking in part because the hospital’s large, communal wards look so different from patient settings in hospitals today. In A History of the Boston City Hospital from its Foundation until 1904, we find out a bit more about Christmas at the hospital. “Christmas trees lighted by electric bulbs” and decorated with gifts for every patient spruced up the convalescent wards.1 If you look closely at the Christmas tree above, there appear to be several small dolls in its branches. Click through the gallery below for the rest of the photos from Boston City Hospital, Christmas 1912. 1. A History of the Boston City Hospital from its Foundation until 1904. Boston: Municipal Printing Office, 1906. 2. Forty-ninth Annual Report of the Boston City Hospital, 1912-1913. Boston: City of Boston Printing Department, 1913. This entry was posted in Collections, History of medicine and tagged Boston, Boston City Hospital, christmas, holidays, hospitals by nyamhistofmed. Bookmark the permalink.